Wallabies are marsupials which, at first glance, look exactly like small kangaroos. They are found in all states of Australia and in Papua New Guinea. Like kangaroos, they carry their young ('joeys') in a pouch, have a strong tail and hind legs, and smaller front paws used for foraging. They feed off seeds and grasses. Wallabies are well suited to the bushy highlands of Tasmania, and are very common in some areas. As Tasmania does not have the flat, open spaces of mainland Australia, the kangaroos are nowhere near as plentiful as wallabies. 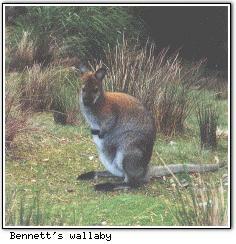 Bennett's Wallaby, 1.37Mb QuickTime movie. The most common type of wallaby in Tasmania is the red-necked wallaby or Bennett's Wallaby (pictured above), which is also found in other south-eastern states. Wild wallabies in populated bush areas such as Coles Bay are quite friendly toward humans and will accept food. However, feeding native animals is discouraged because it can lead to illnesses such as `lumpy jaw'.